Cisco officials are refreshing the company’s campus and edge switches and routers, bringing greater programmability to the appliances as the company looks to continue pushing forward with its Cisco Open Network Environment initiative. The new switches and routers are part of Cisco’s larger Cisco ONE strategy of bringing greater programmability to all parts of the network. The new products include the Catalyst 6800 backbone switching line, a new supervisor engine for Cisco’s 4500-E chassis-based access switch, a new high-end ISR branch router and application performance extensions to the ASR 1000 edge router. As a part of the company’s new Enterprise Network Architecture, The new and enhanced switches and routers are designed to drive the programmability and automation to networks that are needed to deal with such significant data center trends as mobility and cloud computing. The networking giant, which this week hosts its Cisco Live event in Orlando, says its new products fit within an Enterprise Network Architecture under which applications, network services software and hardware networking functions all work together. Cisco’s Open Network Environment (ONE) and onePK developer toolkit are the company’s answer to the demands for more simplicity, programmability and automation that have given rise to software-defined networks (SDNs) and network functions virtualization (NFV). According to Cisco officials, the goal of Cisco ONE is to bring software programmability throughout the network—from ASICs and operating systems to networking functions and services. Cisco’s onePK enables developers to create networking applications that are designed to facilitate business applications. With the Enterprise Network Architecture strategy, Cisco officials said they are looking to bring greater programmability and openness to campus and branch environments to improve performance and agility, and make them more application-aware. SDN makes network functions less reliant on specific hardware and operating systems, and more accommodating to commodity switching and open source software. It threatens Cisco’s dominance and fat profits in routers and switches. Cisco is combatting the SDN trend by attempting to tightly link software programmability of network infrastructure to custom-developed ASIC hardware and hardware-specific operating systems, and defending its incumbency and massive installed base. These new products are instantiations of that strategy. Cisco says it will support onePK across its entire enterprise routing and switching portfolio within the next 12 months, beginning with the ISR 4451-AX and ASR 1000-AX routers announced this week, which will support onePK in late summer/early fall. The Catalyst 6800 is an outgrowth of the ubiquitous–and 10+ year old–Catalyst 6500. The Cisco 6800 is targeted at campus backbone 10/40/100Gbps services. In addition to network programmability, the 6800 is supervisor- and line card-compatible with the 6500, Cisco says, adding that there is still no date set for retiring the 6500. Sources say Cisco still has a vibrant roadmap for the Catalyst 6500, including a 10Tbps supervisor engine in the works. Cisco confirmed that a 10T supervisor engine is planned for both the 6500 and 6800 switches. The company would not say when it’s coming. The 6800 lines include the 6807-XL, the 6880-X and the 6800ia. 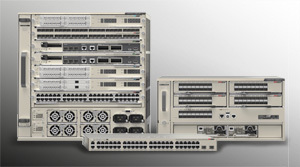 The 6807-XL is a modular campus backbone switch with a seven-slot, 10RU chassis. It supports up to 880Gbps per slot and 11.4Tbps of switch capacity. It will go head-to-head against HP’s 11Tbps 10500 switch, and Juniper’s EX8200 and EX9200 switches in Virtual Chassis configurations. By contrast, the Catalyst 6513-E with the Supervisor 2T supports 80Gbps per slot but that bandwidth can be doubled in a Virtual Switching System configuration. The Sup 2T can work in the new 6807-XL chassis, as can 6700, 6800 and 6900 series line cards for the Catalyst 6500-E, Cisco says. The 6807-XL is optimized for 10/40/100G Ethernet switching, while the Catalyst 6500-E is optimized for 10G. The 6880-X is a 3-slot, 4.5RU switching with a fixed supervisor engine–it cannot be changed. It supports up to 80 10G ports or 20 40G ports, and is targeted at mid-market/mid-sized campus deployments. The supervisor sports 16 10G ports, and the switch’s four half slots house optional 10G and 40G line cards. The Catalyst 6800ia “Instant Access” switch is designed to support automated deployment and provisioning through “one touch” programming, Cisco says. It allows IT departments to virtually consolidate access switches across the campus into one extended switch. The 6800ia sports 48 Gigabit Ethernet ports and two 10G uplinks. The switch is analogous to Cisco’s FEX fabric extension architecture with the Nexus 7000 data center switching systems, analysts say. The new Supervisor Engine 8E for the Catalyst 4500-E modular access switch includes Cisco’s new programmable UADP ASIC for wired and wireless convergence, which was unveiled early this year. It is designed to unify wired and wireless policies and management. The 8E works with existing Catalyst 4500-E chassis and line cards, Cisco says. For large branch deployments, Cisco’s new ISR 4451-AX router features up to 2Gbps forward performance with native Cisco WAAS-based WAN optimization, and “LAN-like experience” at the branch, Cisco says. Complementing that is the ASR 1000-AX WAN edge router, which integrates Cisco’s Application Visibility and Control and AppNav capabilities with virtual WAAS WAN optimization for providing application control and services on WAN links aggregated from branch sites. The Cisco ISR 4451-AX is available now with prices starting at $18,000. The ASR 1000-AX and 4500-E Supervisor Engine 8E are scheduled to be available in July, at starting prices of $45,000 and $28,000, respectively. The Catalyst 6800 switch series is scheduled to be available in November, at a starting price of $40,000.